Each state has at least one signature food. West Virginia is the home of the pepperoni roll. If you have never had one, they are delicious. A sweet, yeasty roll with pepperoni and sometimes mozzarella or pepper jack cheese. Growing up in Seattle everything revolved around salmon and pan-Asian food. I learned to make sushi when I was 9 and still love it to this day. Where you grow up has a large influence on the types of food you eat and what you learn to cook. When I moved to West Virginia I had no idea how to cook southern food. I had never made a biscuit in my life and I had only made gravy from a can. After meeting and marrying my husband I turned to my mother-in-law for help. Over the past 10 years I have learned to make all the foods my husband loves. My husband's side of the family lives in Kentucky and he is obsessed with Kentucky foods. He is obsessed to the point he stocks up on Ale 8 when we go to the grocery store on the other side of the river. One of his favorite regional foods is Kentucky Beer Cheese, so I tried a new recipe for it this week. This recipe has 7 ingredients. It takes 15 minutes of total time, all of which is active and makes 16 servings. My husband made the majority of this recipe and he made a few changes. I had to help him use the blender since I don't think he had ever used it before. He was a fast learner though. For the cheddar he used extra sharp cheddar, PBR beer, 3 cloves of garlic, Tabasco and a slight amount of horseradish. When I blended the cheese in the blender I added it in batches, putting the beer in first. After the cheese was blended I let it sit overnight in the fridge for the taste to mellow. The first day this cheese is made it's pretty strong. However, by the second day it's perfect. I would suggest cutting the garlic down to only 2 cloves and my husband thinks that it would be better with Yuengling beer. It is great served with crackers or spread on a toasted baguette. Does your region have a food that it is known for? (I love finding out about regional foods!). For the recipe go to Kentucky Beer Cheese. Thanks for the pin, my husband loves this! Let's see we have brats and wild rice in the midwest... and at the state fair about anything deep fried or on a stick! I tried a deep fried snickers last year, it was actually pretty good :) And I love brats! Sounds so interesting! I am in SE Missouri and close to St. Louis which of course is famous for toasted ravioli! Yum to the toasted ravioli! I have no clue what our state food is, but I am thinking it must be some sort of seafood dish. This beer cheese sounds good. I have never heard of beer cheese before. I would guess seafood too! Oh wow, I love cheese (and beer) and this looks amazing. I've heard of it before but haven't tried it. I miss pepperoni rolls! My best friend's mom always made them when I lived in PA. Thanks :) Pepperoni rolls are great, aren't they? Pinned to my Party Hardy Grubs...I know this would be devoured at any get together....or just while watching tv having dip and chips...a regular occurrence here at my house! Thanks for sharing Ann! Thanks for the pin :) My husband loves this recipe, he ate most of the 16 servings! Beer cheese is awesome! 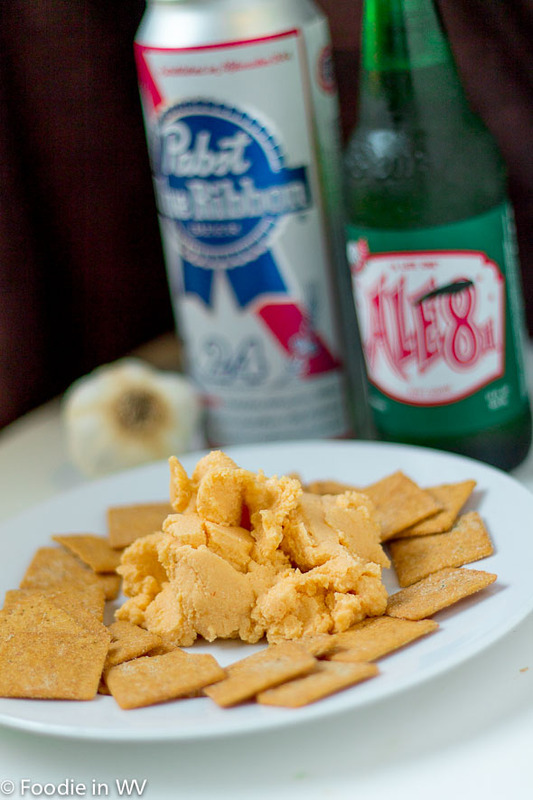 We have a place in NYC up by us called Earl's Beer and Cheese that makes delish beer cheese! I agree :) My husband would be so jealous that you have a place that makes it there. We have to go across the river to find it (which is literally a couple of minutes away so it isn't too big of a deal). This sounds yummy. Does enough of the alcohol burn off do you think so it's safe for pregnancy? The beer does not get cooked, so it is still there :) It would not be something for kids or pregnant women. I do think though that the brands that you buy at the store have had the alcohol evaporated. This recipe would be for adults only though :) We live across the river from OH and I agree that they have great small breweries! This was the first time I had tried making it :) It turned out great! It really is good, my husband loves it!